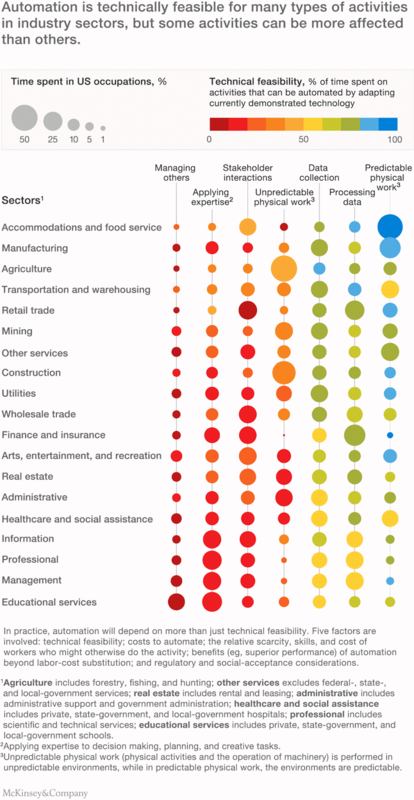 Machine learning to the employment has been a topic in debate. Darrell West, in his paper titled "What happens if robots take the jobs? The impact of emerging technologies on employment and public policy” suggested a list of actions government should take to ensure people whose job has been replaced by machines can live a decent live. The general sentiment seems to suggest a turbulent era as work force transform. Growing up in China during the time of State owned enterprise reform, I had real experience living through the time of large group of people being laid off because the jobs were suddenly gone. My parent’s generation had to learn new skills for a completely new industry at their 40s and 50s. Few of them made it and even became millionaire, many of them didn’t and the family suffered a lot. I followed the news of Detroit Car manufacturing industry lapse and it shows familiar traits. The fact is, jobs come and go all the time, employee as a group will constantly adapt while individuals may not be able to change. McKinsey’s article on ‘Where Machine Could Replace Human and Where They Can’t (Yet)” points out, technical feasibility is a necessary precondition for automation, but not a complete predictor that an activity will be automated. HSBC, which is the “incumbent” bank (of course, there is no such word, and HSBC has 37.86% of its revenue coming from outside Hong Kong, but as a Hong Kong citizen we have such a deep connection with it that we consider it to be “Bank of Hong Kong”) is under going a transformation project to automate key work flows and with it many administrative and compliance work will be lost. Nevertheless, the unique feature of Machine Learning is, comparing to the other industry reforms I have experienced or read, it empowers companies equally as it empowers individuals and extends the capabilities of the users. Leaders in the industry have developed and kindly shared many tools to the public to harness the power of machine learning. Google Prediction API allows predicts an output value for a set of features using a simple training set applied to different models. The IBM Watson Developer Cloud offers a suite of APIs that allow developers to build applications that utilize machine learning technologies such as natural language processing, computer vision, and prediction. As product managers, I’m learning the skills in user interviews, A/B testing etc, aiming to make my products that utilize machine learning to better serve end users. Predict Performance and Turnover for Human Resource: predict performance and turnover as well as suggest high quality potential candidates: Benefit & HR software EaseCentral use machine learning to allow HR managers to compare lots of data to predict employee happiness and turnover. Phenompeople provide prospective candidates with "Jobs they might be interested in" based on historical data and match the job requirement with candidate profile to suggest recruiters high-quality candidates from large number of candidates. Improve Underwriting for Insurance Account Manager: automates underwriting and claim processing. 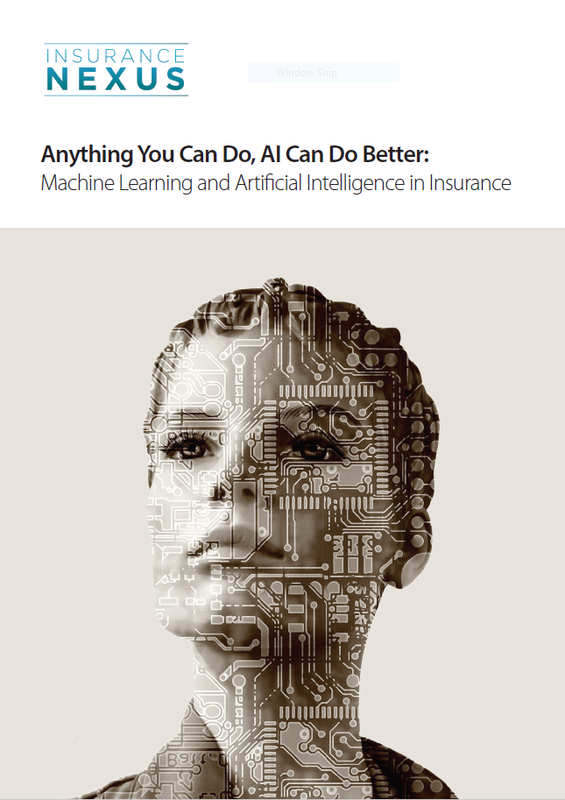 George Argesanu from AIG & Monika Schulze from Zurich, in their article "Anything You Can Do, AI Can Do Better: Machine Learning and Artificial Intelligence in Insurance” discussed the possibility to move beyond pricing and venture into Fraud, Claims, Marketing, P&L Analysis, Behavioral analysis and Preventative insurance. Say for example, autonomous cars, how will insurer quote price comparing to those manual-driven cars? An AI-driven home management systems can self analyze the damage it suffered from a natural disaster, provide full trail of the event etc, but can insurers use these data to facilitate their claim process and even create new products? These are all questions left to be explored. Obtain Better Lead for Sales & Customer Service: improve quality of the leads. Per Harald Borgen wrote about how he train a machine to qualify the lead quality at Xeneta through reading company profile. In the “Sales Gets a Machine-Learning Makeover” article, the Accenture Institute for High Performance found at least 40% of the companies surveyed are already using machine learning to improve sales and marketing performance. What changes will machines bring to us as employees? The question is for us to answer. 2 things are very certain: first, work is part of us, we spend between 26.37 to 43 hours per week out of a 168 hours in which only less than 80 hours of them are not sleeping, eating, commuting etc; second, we need to create value for the society to earn a living. Machines learning can help on both: it helps us work smarter and work less; make use better our spare time and create more value using less resources. If we refer to the episode of "Fifteen Million Merits” from Black Mirror, it may even be able to make us feel fulfilled by riding a bicycle. The key question is, how do you get yourself feel fulfilled riding on that bicycle and if we can’t, what are we going to do to avoid that?